On April 12, 2016, billionaire Yuri Milner and cosmologist Stephen Hawking will announce a new space-exploration project called Starshot. 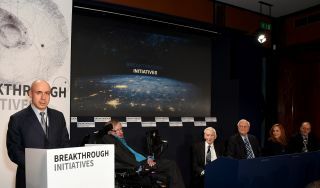 This photo shows Milner (left), Hawking (second from left) and other researchers in July 2015, during the unveiling of a $100 million search for signs of intelligent alien life called Breakthrough Listen. This story was originally posted on Monday, April 11. It was updated on April 12 to include the nature of the Breakthrough Starshot initiative.